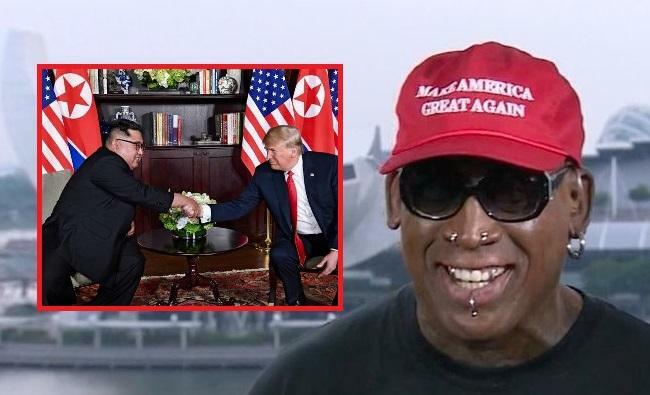 Former NBA player Dennis Rodman, one of the few people who travelled to North Korea to meet Kim Jung-Un before, appeared on CNN to comment on the historic meeting between US President Donald Trump and North Korean leader Kim Jung-Un. He clearly became emotional as he told presenter Chris Cuomo how happy he was for this historic moment to have taken place, something he longed for a long time. During the rambling interview, Mr Rodman described his feelings about the summit and told about all the bad press he received about his visit to North Korea before. The former NBA star complemented US President Donald Trump on the ‘great job’ he was doing and said POTUS “will understand that the people of North Korea have a heart, have a soul, charisma and love each other”. “I think that country is normally hearing people who are always lying, deceitful and not trustworthy. I think that if President Trump goes in there with a great heart, with his heart on the table and let Kim Jong-un see him really emotional … it ain’t got to be about war, it ain’t got to be about hatred or what happened in the past. Not so fast, Dennis. America will find a way to start a war with N. Korea.